Do you love to drink lemon tea? Lemon is rich in antioxidants ‘bioflavonoid’. These antioxidants are great for your health. But consuming it in excess can be dangerous for your health. Over consumption of this tea can lead to diseases that can remain for lifetime. So, be careful about the side effects of this tea. It can cause osteoporosis or ulcers if you drink too much of this tea every day. So, make sure that you consume it in limited quantities. It has lots of health benefits but consuming too much of it can be harmful for your body. When you add lemon to your tea, the aluminium present in the tea gets absorbed in the body. This does not happen if your drink normal tea. The aluminium thus absorbed can be toxic to the body and can lead to encephalopathy, osteomalacia or aplastic bone disease, proximal myopathy, increased risk of infection, increased left ventricular mass and decreased myocardial function, and microcytic anaemia with high levels and even sudden death. According to some studies made, it was shown that consuming lemon tea can increase the chances of Alzheimer’s in the later stages of life. By consuming lemon tea regularly, accumulation of plaque in the brain may take place. This has been linked to the onset of Alzheimer’s. Drinking too much of lemon tea may irritate the mucous membrane. It can even lea to canker sores. So, you can see that lemon tea can play havoc in your mouth. It can lead to canker sore in the mouth that can permanently hamper the functioning of nerves and tissues present in the mouth region. Lemon tea is believed to hydrate your body and prevent any possibility of dehydration. But when lemon tea is consumed in excess it even works as a diuretic. This means that it can cause dehydration in your body by giving you frequent urge to urinate. So, consuming lemon tea frequently can be dangerous as it may cause dehydration in the body. By consuming lemon in excess, the pH level of your stomach and intestine may get altered. This can cause acid reflux, which is a condition in which the acid from your stomach moves up to your oesophagus. This can cause a burning sensation in your chest. It may also cause vomiting in some people. Drinking lemon tea is not good for your bone as it silently flushes out a large anoint of calcium from the body through urine. This can lead to osteoporosis in the later stages of life. Some people may suffer from stomach ache, diarrhoea, ulcer and irritable bowel syndrome when they consume lemon tea regularly. 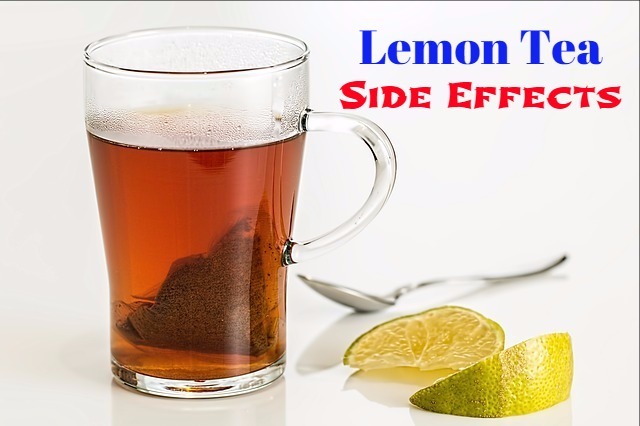 People drinking lemon tea regularly often show signs of tooth enamel erosion. Lemon tea can greatly affect the enamel of your teeth. By eroding enamel, it makes your teeth very sensitive to sharp changes in weather. You may also suffer from acute pain as a result of it. When you have something that is too cold or hot, your teeth may become very sensitive and exhibit pain. Pregnant women are advised not to consume lemon tea. This is because it contains caffeine. If they consume lemon tea in excess, it may lead to miscarriage or other severe side effects. Like pregnant women, women who breastfeed their babies are also asked to avoid lemon tea although it is refreshing. This is because it contains caffeine. This caffeine from the tea can blend with the breast milk and may cause harm to the baby who completely depends on breast milk. These side effects of lemon tea are quite serious. But it does not mean that you totally avoid consuming lemon tea. It can relax you and also offers you some benefits. All you have to take care is to consume it in moderate amounts. Make sure that you don’t drink more than one cup of lemon tea a day. Avoid having it first thing in the morning, on an empty stomach. If you suffer from any symptoms lire tooth sensitivity, stomach ache or nausea, try to give this habit a break. Consult your doctor and know about the benefits and side effects of this tea. How to Prepare Lemon Tea? Take a teapot and add the tea leaves or tea bags to the teapot. Then add lemon slices and sugar. You may also add the cinnamon sticks if you want it a little spicy. Now pour the boiling water over the ingredients and keep it aside for 5 minutes top steep. Strain it in to cups or glasses and garnish it with lemon slices. Have it cold or hot as you wish. Pour the water into a pan and boil it over the stove top. Once it starts boiling, take it off from the heat and add two tablespoons of lemon juice to it. You can use freshly squeezed lemon or the lemon juice bought from the store. Add sweetener according to your taste. You can add honey or stevia as they are healthier than sugar. Your tea is ready to serve.